Archbishop Makgoba born on the 15th day of December 1960 as Thabo Cecil Makgoba is the South African Anglican Archbishop of Cape Town. 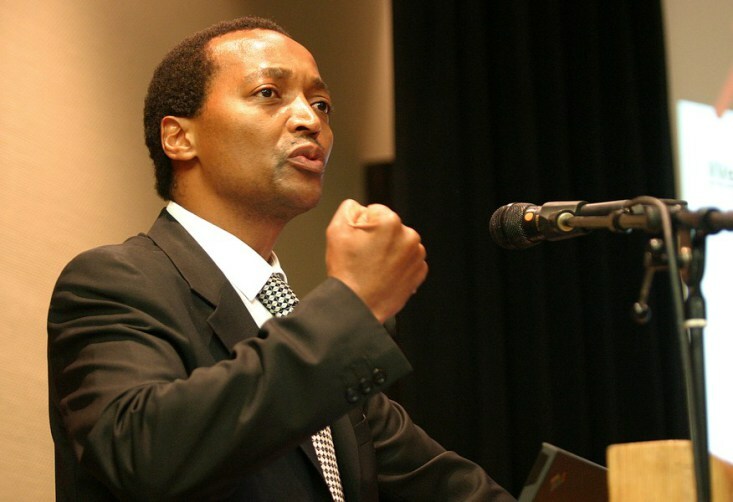 He has severally kicked against the leadership of President Zuma and the poor state of affairs in the country. He recently urged the new leadership of the country’s ruling party, the African National Congress (ANC) to get rid of Mr. Zuma as the President of the country. In his Christmas sermon, the Archbishop asked the new President of the ANC, Cyril Ramaphosa, to give the ruling party a new lease of life by cutting the umbilical cord which ties the party to the Zuma era. Excerpts from the sermon said: “…Cyril Ramaphosa promised us that his party will be more responsive and more accountable to us…he told us that the ANC will act against corruption, collusion, and other economic crimes, whether they be in the private or public sector. Most importantly, he told us that the people of South Africa want action, not words. For this and other reasons, the Black First Land First (BLF) movement proclaimed Archbishop Makgoba Devil’s servant. The party described Makgoba as an evil man masquerading as a man of God. “The devil in pious robes is what defines the Archbishop of the colonial Anglican Church…(his) duplicity knows no boundaries…he is a servant of Satan himself,” stated the party. Let’s take a look at the reasons why BLF announced the man of God a servant of Satan. You can’t get BLF to change its mind about this, the party is convinced that Archbishop Makgobo is the embodiment of the Pharisees who Jesus Christ sjamboked out of the holy temple. BLF believes Makgobo has sinned against the One True God and against the souls of the Marikana workers through his serving of the evil agenda of white monopoly capital. The revolutionary socialist party wants South Africans to stop believing that the Archbishop is fighting against corruption. To the party, he isn’t. They believe that if he actually was fighting corruption, he wouldn’t have been silent on the biggest corruption of 2017 when the white-owned Steinhoff took away R17 billion from the pensions of our people? “Where is the voice of Makgoba when Pravin Gordhan and his friends fleece R4.5 billion from Treasury? Where is the voice of the man of God on on-going mass evictions of the poor and landless from farms and cities?” Asked BLF. In a manner corresponding with the foregoing, BLF explained that handlers of the Archbishop are impatient about getting rid of Jacob Zuma so that they can slaughter his radical economic transformation plans like the workers of Marikana. “Our nation is tired of evil men masquerading as servants of God. The agenda of white monopoly capital is evil and must be rejected by all righteous people. We say no to a coup in South Africa,” charged the party.